In the last twelve months one of my little sisters has struggled with depression. I think she’s coping remarkably well with it and I’m really very proud of her. Recently she got some bad news and in one of my weekly ‘putting the world to rights’ calls with my mother, I said that if she looked like this might set her back we should encourage her to get a cat. Mum laughed and agreed, and then the next day phoned me frantically to exclaim: you should blog about that! So here is the blog about pets and depression! I have good reason to suspect a pet would help my sister, as well as other people with certain kinds of depression. And it’s not just because of this Eddie Izzard sketch. There are two many theories regarding why we keep pets, and I’ve spoken about them before. They boil down to this: either pets take advantage of us, or pets give us some advantage in life. Much of what I’m going to talk about today falls under this second theory, but remember – it could just be a way our little social parasites have evolved to keep us sweet. One of the most interesting (and sadly unpublished) pieces of research I’ve ever done was investigating how online pet obituaries represent owners feelings about a pet passing away. Pets are very dear to their owners. People often say they love their pet ‘like a child’. Interestingly, when people have been asked to rate how the loss of a pet makes them feel, they’ll say it’s analogous to losing touch with an adult child (Gage & Holcomb, 1991). Therefore the loss of a pet is a stressful event – just what I want for my blue sister, right? The inevitable loss of an animal. What I find really interesting about that comparison is that it talks about children, but doesn’t directly compare the loss of a pet to the loss of a child. Part of me wonders if there’s not a little bit of cultural bias in there. You’re not allowed to say that losing a pet is as bad as losing a child (and personally I can’t imagine that it is), but that language seems to put it as close to the worst possible feeling as is socially acceptable. If I was to put on a white lab coat and force you to do a mental arithmetic test, you’d get stressed out. This is a pretty common psychological stressor. If I made you do it in front of a friend, you might even get more stressed out, your heart rate would rise. However, if I made you do arithmetic at home, you’d feel calmer. What’s really interesting about all this is if I made you do arithmetic at home in front of your best friend, and then made you do arithmetic in front of your dog, and lastly all by yourself, you would be even calmer with your dog than by yourself. (Allen et al, 1991). Animals have this amazing ability to calm us down. Blood pressure (and heart rate) go up with mental stress. Allen (who seems to have enjoyed making people do mental arithmetic in their home, I can only imagine she creeps up on neighbours with multiple choice tests) tested the presence of a dog against ACE inhibitors, drugs designed to lower blood pressure, and in the presence of mental stress, the dog helped people to cope better than the drug (Allen et al 2001). This doesn’t mean dogs are natural anti-depressants. Karen Allen (unfortunately, not this one) uses a great phrase to describe how we view dogs: nonevaluative social support. Which is a scientific way of saying ‘dogs are awesome because they don’t judge me when I’m eating Nutella out of a jar’. As an aside, I’ve heard some people complain that cats are more likely to judge than dogs, but I’ll point out cats have this weird fascination with accompanying you to the toilet, and like to make eye contact with anyone in the vicinity while they themselves are defecating, and so I’ve never felt too judged by any of my cats. Don’t go to down the road of thinking that pets, or dogs, can ‘cure’ depression. But what they can do is alleviate stressful states (Wilson, 1991). I have this belief that a child should have a pet. It’s probably one of my strongest child-rearing beliefs (apart from the whole ‘feed them, love them, clothe them’ idea). But I also believe that the elderly should have pets too. My stepmother recently passed a significant birthday (I hasten to point out she’s not elderly). Her and my dad’s beautiful dog Rosa is entering old age however. At the significant birthday we talked about retirement and I pointed out that after Rosa passed, they’d have to get a new dog at retirement. I couldn’t imagine them filling their days without a dog, for all there will be a long period of grieving after Rosa’s death. My dad tells a story about his family. He, his sister and his mother conspire to get their dad a new dog after the old one dies. My Grandpa insists he doesn’t want a dog, can’t stand the thought of another dog, that their old dog was the only one for him. Newly retired, he sits in his living room and sulks. 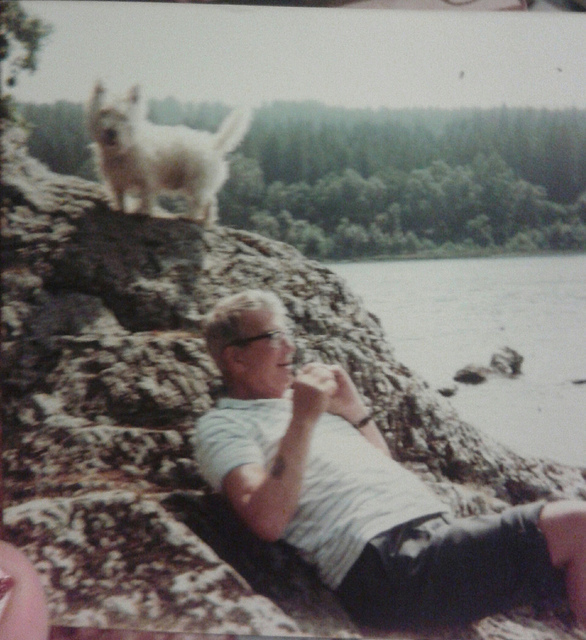 My dad, my aunt and my grandmother go to a breeder who has some highland terrier puppies. They select a tiny white ball of fluff and take him home. They open the door to the living room and send the puppy through, waiting in the hallway for the reaction. The puppy’s name was Angus, and he is the first dog I remember. He was my grandpa’s companion through my grandmother’s death, and helped me and grandpa chase flies with the hoover. This is the essence of non-evaluative social support. When there are bad times, or particular stresses, they somehow help us cope. Elderly people require more social support, this manifests in reports of feeling lonely, of multiple visits to the doctors, etc. However elderly people with pets report visiting the doctor less often (Siegel, 1990, Knight and Edwards, 2008). And given the physiological changes that Allen recorded, I’m happy to assign this difference to the act of owning pets (as opposed to pet owners being less likely to visit the doctor because of some internal difference), but it should be pointed out that there are lifestyle benefits to pet owning. But one of my absolute favourite papers about the benefits of pets to vulnerable people (yes, I have a favourite), is one by Kaminski et al (2002) [someone hosts a pdf here]. What’s more vulnerable than a hospitalised child? It’s a horrible thought. We have all sorts of therapies to help children adjust to being in hospital, and these include pet therapy. In this simple little study, the authors asked kids to rate their emotions before and after a play therapy session and before and after a pet therapy session. Pet therapy had a bigger effect on their positive interactions than play therapy did. Pets made sick kids feel good, and it wasn’t even their pet. We Know The Effect, What’s the Reason? This is the kind of scientific question I love – we see a nice measurable effect, but the why of the question is something intangible. It’s not a ‘real’, ‘quantifiable’ thing, and I think this is why I love animal personality. I love the difficulty of wrestling with non-linear qualities and multidimensional space. No one tell my old maths teacher. Archer (1997) [a pdf here] wonders ‘why’ people love their pets. I love the part of this paper that talks about how often people show such an attachment to their pets that they do something ‘odd’, such as make the pet the best man at a wedding, fight for legal custody, etc. He talks about the commonly held idea that people own pets to make up for a deficiency in their human relations. If you can’t make real friends you go out and become a cat lady. (Here I’ll point out I’m currently considering getting a cat of my own). Ultimately Archer dismisses this, in part because in Western society we are very influenced by a particular line of thought which gives humans “ dominion over the fish of the sea and over the birds of the heavens and over the livestock and over all the earth and over every creeping thing that creeps on the earth” (Genesis 1:26), and in part because many studies show that pet-owning correlates with a lot of personality traits we consider desirable in our society. In the end Archer is a proponent of the social parasite theory and says these advantages are not enough to provide an advantage to human survival. I’m not sure I agree, but that’s a topic of another post. The point is that whatever the mechanism, people feel a very strong attachment, undeniably love, to an entity which does not judge or present them with the kind of social contract that we engage in with other humans. Back to the Sister . . . I think my sister is doing fine. I hope she continues to do well. Do I think that cat would ‘fix’ her? No, not at all. But I do appreciate the phrase ‘unconditional love’. This next statement I have no reference for, but I think you’ll see it for what it is . . . In films, tv shows and stories, there’s often a moment where somebody with little else to value in their life has their precious pet taken from them. We’ve named a trope for this effect: ‘kick the dog’. Who didn’t cry the first time they watched Kes? We know this feeling of love for our pets so well that when someone hurts a pet, we know it is immediate short-hand for ‘this person is so evil they have removed the last remnant of support from a person’s life’. I don’t recommend dogs to combat the black dog in general, but I do think there’s something to be said to coming home to a pair of brown eyes. Hyperbole and a Half – Not a resource but a truly insightful look into what it feels like to be depressed. I’ve always wondered if having a pet around would have helped alleviate my own bouts of depression. However, I have a rather irksome allergy to animal dander, which is an absolute shame as I would love nothing more than to have a dog or a cat around the place. Do you believe that a non-dander-producing animal, say a fish or a snake or perhaps even a bird, would hold the same benefits over one of the cuddlier members of the animal kingdom? I know that’s really more of a human psychology question more than anything, but I no of nobody more expert in the ways of animals than you, and the article sparked a thought! I think that looking after something (even plants) produces a more positive state of mind and this can help alleviate the symptoms of episodic depression. I think it’s similar to having a project to work on. But to use an Allie Brosch analogy – I would consider this as being more like “your fish are sick, how can you help them”. When the fish are actually dead I’m not sure how much a lifestyle change can assist. There are some aspects of ‘nonevaluative social support’ that it’s more difficult to get from a non-dander producing animals. Cats and dogs are relatively sociable animals and for the most part they seek out social contact – I think that’s a really important part of the support they give, the feeling of being wanted. While a snake for example certainly needs you, its harder to imagine it wanting you. So in conclusion I’d say they probably don’t provide the same level of support, but certainly an element of support. There probably needs to be more research on it! Fab post Jill, I just wish I knew how to persuade someone very depressed (and in denial about it) who has never had a pet that the activity, love and companionship that a dog would provide would give them a reason to get up in the mornings. I want to point out I don’t think a pet is an instant cure-all. I expect that the first step is acknowledging the problem and to start seeking out a treatment option that works for you. I think pets can be a part of that treatment plan. No of course, I do get that it’s not a cure all, but in this case I really think it would have so much potential to make a difference! Any links to support stuff would definitely be useful. Great blog – just been referred to your blog page on the IAWS course, as an example of how to blog!.. Love your definition of nonevaluative social support! Only in my case, substitute peanut butter for Nutella and my dog wanted to join in! Ha! Thank you for the compliments, Jude, glad you enjoyed the blog. (Amazing it’s being used as an example, guess that means all us scientists need to do more blogging).